Jeremiah Yourth focuses his practice on family law, civil and commercial litigation, and employment law. He enjoys helping individuals resolve a variety of challenging family law matters, including divorce, child custody, support and visitation. Jeremiah has been selected for Virginia Super Lawyers and is listed in the family law category. He also assists both businesses and individuals with a variety of legal issues, including contract disputes, employment disputes, evictions, tenant’s rights and collections. As a former office manager of a small title company, Jeremiah understands the needs and challenges faced by supervisors and small business owners. With this background, he enjoys helping clients find the best solutions to their legal needs. He counsels them on policies, procedures and best practices, among other issues. 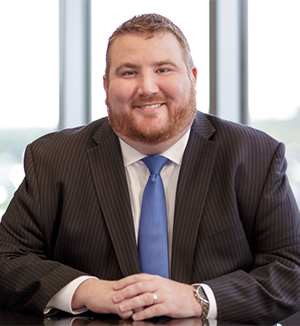 By recognizing and addressing problems as they develop, Jeremiah helps clients resolve minor issues that could otherwise lead to costly litigation. He represents clients in various forums, including courts, mediation and arbitration sessions, and administrative hearings. Jeremiah also helps his clients by using the knowledge and experience he gained as a former Administrative Law Judge. He can provide practical advice on various employment matters, including discrimination, workers’ compensation and unemployment compensation. Not only does Jeremiah focus on working for his clients, but he also enjoys sharing his time and skills with others in his profession and community. He is an active member of the Virginia State Bar, Chesterfield Bar Association, Metro Richmond Family Law Bar Association, Virginia Bar Association and Virginia Trial Lawyers Association. He is currently involved in the Richmond Chapter of the Cystic Fibrosis Foundation and was nominated for the 2012 Cystic Fibrosis Foundation’s “Foundation’s Finest” young professionals. Jeremiah is licensed to practice law in the Commonwealth of Virginia, the State of New York and before the United States District Courts and Bankruptcy Courts for the Eastern and Western Districts of Virginia. Jeremiah earned his Juris Doctor from Albany Law School in 2009. While in law school, he was a semi-finalist in the Donna Jo Morse Negotiation Competition. He also participated in numerous moot court competitions and was a quarterfinalist in the Karen C. McGovern Senior Prize Trials. Prior to attending law school, Jeremiah graduated with a B.A. in Political Science from the University at Buffalo, State University of New York. While there, he worked as the Assistant Director of Group Legal Services, which provided legal services for both students and faculty. These services ranged from representation in university disciplinary proceedings to representation in court.